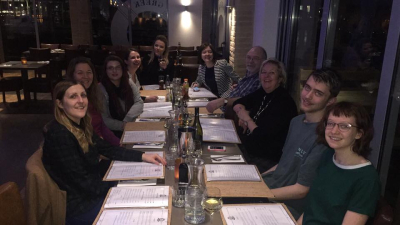 Following on from our last blog, after the apt team successfully escaped from Trapped Escape Rooms, they headed to the new Greek on the Docks restaurant overlooking the harbour for lots of food and a cheeky bottle (or two) of wine! Upon entering the restaurant which opened in Summer last year, we were all greeted by smiling faces and beautiful aromas. Our waiter, Nikos was absolutely exceptional and did not only keep the beautiful house wine flowing but also kept us giggling throughout the night. Kolokithakia: Battered courgette chips, served with Tzatziki. Caramelised Onion Fava: Traditional yellow bean puree with caramelised onions and balsamic drizzle. Dolmadakia: Vine leaves stuffed with rice. Kleftiko: Slow cooked lamb in filo pastry with tomato and cheese. Moussakas: Layers of aubergine, courgettes and beef mincemeat. Gemista: Peppers and tomatoes stuffed with rice and vegetables. Baklava: Delicate sweet pastry with nuts and syrup. We would really like to thank Greek on the Docks for having us and for a lovely evening complete with gorgeous food and wine. If you haven’t already, we definitely recommend you book a table, oh and don’t forget to try the Kleftiko, it’s very tasty! Greek on the Docks have also recently launched a delicious lunch menu with one course starting from just £6.90 so be sure to try that out too!